An organized closet is an essential part of living a more organized and simpler life. When your closet is filled with clothing that reflects your lifestyle and sense of style and is organized in a way that works for you, getting dressed is an easy and enjoyable process. So how do you organize your closet? Here are five tips to make your seasonal closet switch out a breeze. 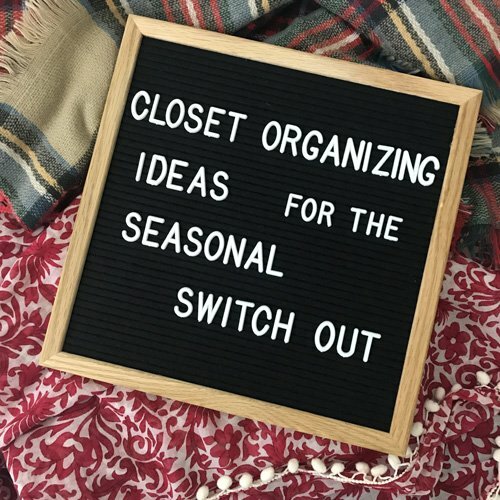 Want to know my secrets for a simple seasonal switch out? Here you go. These are the same steps I used to organize my closet for fall. Pull items out of your closet and onto your bed. First, I removed my spring and summer clothing from my closet, taking out anything that felt too summery in terms of colors, fabric, or style. These were items I knew I wasn’t putting into rotation anymore because even though it’s still warm out, I’ve been reaching for items that look more fallish. Edit. Next, focusing on one garment type at a time, I removed items from my closet with an eye for editing. I donated items I didn’t wear during the past season. Part of having an organized closet is filling it with items you truly love and wear. If it didn’t work in the past six months, it’s very unlikely to work next year. Also, I tried things on! When you organize your closet, only fill it with pieces that fit and flatter, items you’ll be excited to put on. If your size fluctuates, only keep items that you will love wearing when you get back into a size you’re keeping, but move those items into storage. Free up your closet space for items that fit your body right now. This is the only way to get a really good feel for what your daily options are for getting dressed and it’s the best way to determine the holes in your wardrobe that need to be filled with a shopping trip. Put away. After editing, I returned the keepers back into my closet. At this stage, put items that fit and are in-season now (regardless of what the thermometer says) back into your closet, sorting like garments together – skirts with skirts, dresses with dresses, tops with tops, etc. Put donatables in a donation bag and put out of season items into a stack on your bed. Bring your seasonal items out of storage. This is the fun part. I like to pretend I’m out shopping, at a trunk sale, for example. As I pull clothing out of your storage container, I pay attention to which items delight me? I ask: Which things are you happy to see? Which items would you buy again from your trunk sale? Put these items into a keep pile. Edit again. As I took items out of the storage bins, I tried them on. If an item doesn’t fit and it isn’t worth working your way back into, let it go! Also let go of those items that you really weren’t happy to see as you pulled them out of storage, as well as those that just don’t fit your sense of style any longer or are past their prime. Put away the keepers. Everything that made it through the litmus test went back it my closet, organized like the first round. Place your out-of-season keepers in the storage containers you just emptied. Keep those items that you’re working your way into size-wise separate from other items so they’ll be easy to find when you hit your goal weight. Take stock. As I go through this process, it becomes clear which items I have plenty of (plain colored dresses and black pants) and which items need a refresh or replacement (non-neutral cardigans, booties and boots, a nice pair of jeans, winter coat / jacket). Make a list of items you want and need and then move onto the next step. Peruse Pinterest. Before shopping for the season, I always shop on Pinterest first. Perusing Pinterest for outfit ideas will help you figure out basic items you need to purchase to fill out your wardrobe as well as ideas on new ways to wear items already in your closet. One way I find using Pinterst particularly helpful is by studying the outfit formulas. Realizing that I need to dress in at least two layers to not get frostbite at work helps me find outfit ideas that work for me. Then, I translate those outfits into formulas. For example, some of my favorite formulas for fall are dress + cardigan + tights + booties and dress + blanket scarf + tights + boots. When I discovered this, it helped me prioritize that top layer while out shopping. Shop! Remember to take your list and stick to it. When you do, you’ll find you love your organized closet and everything in it. Getting dressed will truly be a breeze. Edit as you go. Finally, to maintain order for the full season ahead, make it a habit to edit as you go. Place a laundry basket or storage bin into your closet and use it to collect items you continually pass up when getting dressed. You’ve just created a self-maintaining closet! What could be better than that? Are you ready to do your seasonal switch out? What tips do you have for making the process more fun — and productive? I can’t wait to hear! You bet I remember you.I appreciate how you recognized you needed a change and then went about getting it. I find that admirable. Glad to hear from you. Thank you, Linda! I appreciate your kind words!